Posted by Mitchell in Art, Knives. Yeah, that’s over 500 bucks for a Buck knife. It’s the paua shell scales on the handle that packs on the price. Maybe for Christmas. 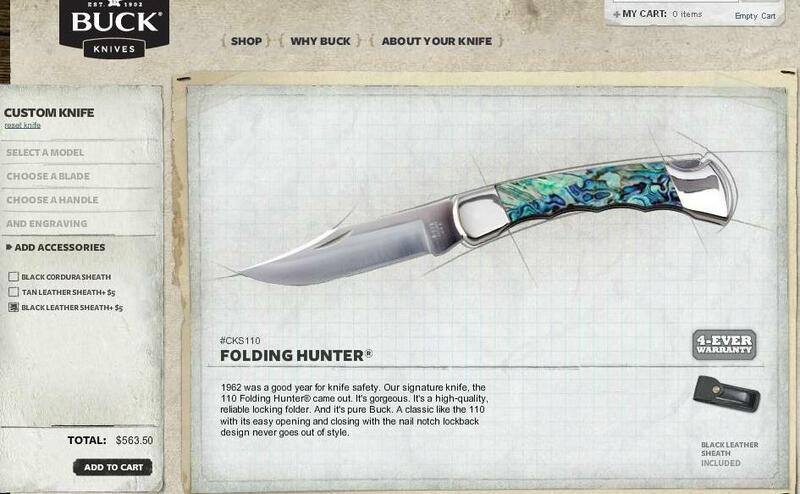 You can build your own Buck knife if you like: Build A Buck. Posted by Mitchell in Bad Times Ahead, Destined for the Gulags, Home, Politics, Science & Technology, Zen Magnets. Hopefully that title will convert to a twitter hashtag. If not it will be changed. Recently the Consumer Product Safety Commission decided to shut down companies that make and distribute spherical magnets. This isn’t directed only the Big Guys like Buckyballs but also smaller outfits that I buy from like Zen Magnets. This is yet another trumped up “product safety” non-issue that out of control governmental agencies LOVE to meddle in. Why? For no other reason than that they can I guess. Or more likely a personal vendetta from someone with clout in the agency. Whatever the reason it is a real threat. Amazon, ThinkGeek and other retailers have already yanked these products. These companies aren’t really all that big. They will die before they ever manage any “appeal” process. It’s tempting to attach this to the general anti-business practices of the Obama administration, but this specific instance isn’t really that. This is just the Standard General Leviathan Roll. These huge & largely arbitrary governmental standard bodies aren’t really accountable to anybody and they rule at whim regardless of who is supposedly “in charge”. Somebody goosed this particular mindless piece of million pound of federal flesh to move and it crushed. That’s what it does. That’s not to say that “We” can’t “Do Something” (see recent developments re: Chik-Fil-A). Government agencies will pull back given enough public pressure, but only IF the public knows about it. So far few people know or care about this. It’s getting some notice here and there though, somebody from Buckyballs was on Rush’s show the other day as well as a link from Drudge. Hopefully we’ll get some steam going behind another push back.